One of the most unexplainable we will experience in our lives is death. Everyone has some form of an opinion on what happens to us in the afterlife, where our soul and mind may go. Some believe they have all of the answers, while others seem to remain clueless on the subject. There’s no real, factual evidence anywhere as to what actually happens when we’re no longer alive and living on this planet, and really, there may never be a real way of knowing. One thing we do know for certain, is what happens to our bodies after we die. Humans are one of the rare species on this planet that mourn the loss of somebody after the pass away. We pray, mourn, and feel sorrow for friends and long term family members that we have lost, as well as complete strangers’ we may hear about that have recently passed. Everyone’s idea of what they want to happen to their bodies after they die is different, many have planned it out in wills before they’re even closing to leaving this Earth. Some wish to be placed inside of a casket for eternity, while others wish to be cremated. No matter what you or anyone around you wishes to have happen to them, no two people are remembered or mourned the same way. But some mourn in ways that appear totally different from anything we could’ve ever imagined for ourselves and our loved ones. Some mourn in ways that give us chills straight to the bone by just thinking about it. Others practice mourning rituals that actually have some sense to them. Here are 15 post-mortem traditions that are chilling, let us know which one gives you the chills! 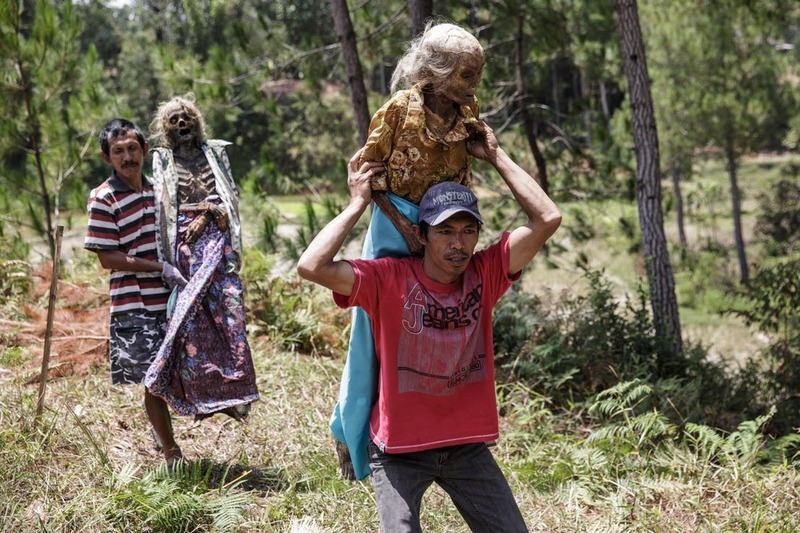 Tomb Sweeping is a practice that is used in Indonesia. Tomb Sweeping is when the burial sight of a loved one is revisited and their body is removed, just like many cultures do on this list. They then proceed to clean up the tomb or coffin, as well as the decaying member of their family. They’ll often even go as far as cleaning up their hair if there is any left and changing their clothes, and possibly finishing up with a decorations such as ornaments and flowers. They also have a small party, and then the body goes back into its tomb. It really feels like this process would be completely emotionally exhausting and draining. It’s hard enough to look at a loved one resting peacefully in their coffin for many of us. Then, we’d have to look at them once again in a few years, only this time around, they are very decayed. Then, we’d have to proceed and bury them all over again. However, like we said previously, this practice is very common for some that they do not even think twice when it comes to things like this.